RodPrjónar: Getting ready for winter. It is starting to get colder and colder here and I realized that I don't have many "winter accessories" in my closet. I have only one short scarf with buttons that I made a long time ago... it was a real odyssey. I made it using brioche stitch and I think I started it abut five times! 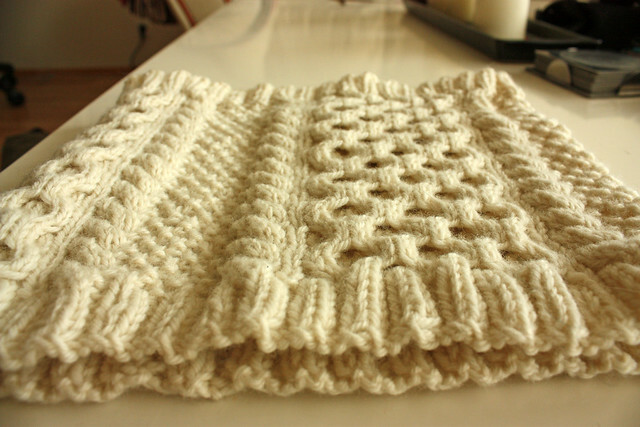 I found that brioche stitch was not so difficult to make but as soon as I made a mistake it was a huge disaster! I got completely lost and took me a long time to fix it! Now, all the effort was totally worthwhile. Brioche stitch is really nice, it makes a reversible fabric that is squishy and warm. I made this one with Bulky lopi on 9mm needles. Hats, holy hats! I have made quite a few of them but I am NEVER satisfied with them! I am just not a hat person. It has to be really, really cold so I get to wear one. Made with Eskimo by drops. Also made with bulky lopi. So, now it was time to make a new scarf and hat. Two years ago I made a cabled neck warmer using some Noro kureyon that I had after having frogged a shawl I made with it. Since I liked the pattern so much I decided to make another one. This time with a yarn and colors that I really liked. I began to knit it about a year ago and then the project fell asleep in the stash basket (along with a couple of other things!) until a few weeks ago when I decided to finish it once and for all! The pattern looks MUCH better in one color. * I made a much shorter version. The pattern called to make it 50cm long and then lightly felt it. I made it just 30cm long and no felting. * I like cables a lot. They make the fabric look look warm and cozy. And well, they don't only have the looks... they are REALLY fun to knit! I like the simplicity of the pattern. * Pattern: Peacock by Karen Borrel. * Yarn: Cascade 220. Less than one skein of the main color. * I didn't make any changes to the pattern. I followed it just as it is. 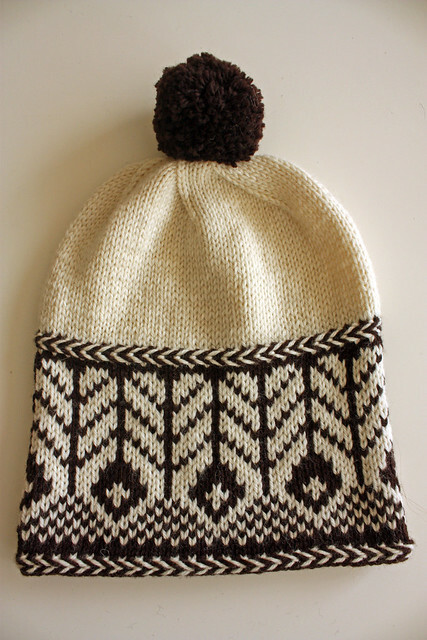 * When I saw this hat the first thing that cought my attention were these two bicolor bands at the beginning and at the end of the fair isle section. I had absolutely no clue about how to make them but it was really easy! And they look very nice! Knitting always surprises me. It is so nice to discover new things that are made with the same simple elements of basic knitting. In this case purling. Yes, the bands are made just using purl stitch and some twisting! * I decided to use cascade 220 to match it with the cowl. Besides this yarn is simply amazing. It is so soft and nice to work with! And it is incredibly warm! I totally recommend it. Now, to finish with accessories, I am knitting a pair of mittens. I think I have said before that I am not a big fan of knitting anything that comes in pairs... but I really need a new pair of mittens. It is really silly that i have only ONE pair that I made almost three years ago! This far, I am done with the first mitten... one more to go! And to finish, a few pics. 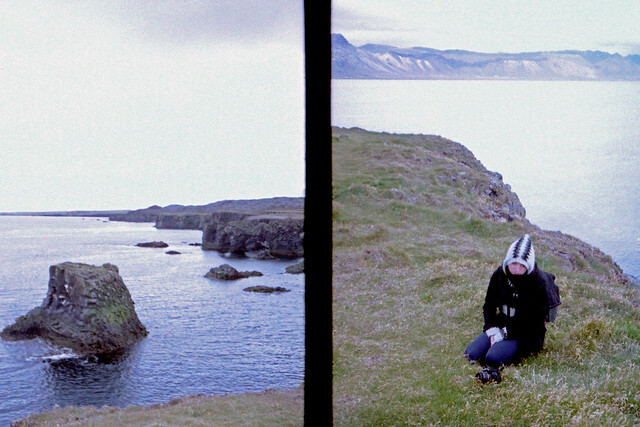 These one were taken in a place called Arnastapi in Snæfellsnes. It is a little village next to sea. 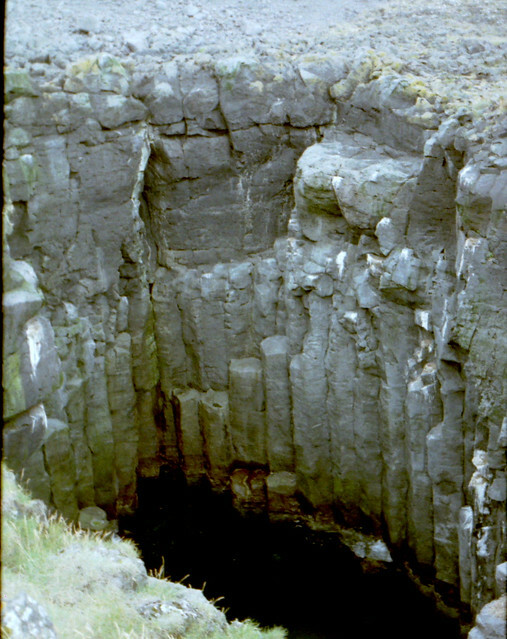 The most amazing thing about this place are the cliffs and lava formations. When walking close to the cliffs it is possible to find a couple of holes. It is not possible to see it in this picture but the sea is on the bottom of this hole. 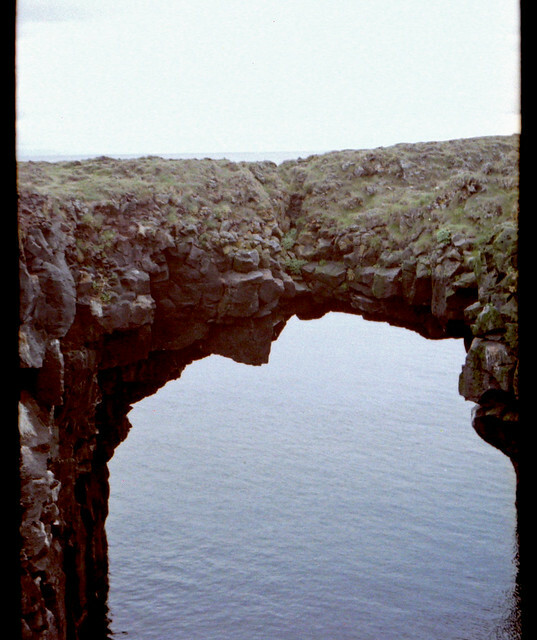 There are also a couple of lava bridges... they are pretty cool. 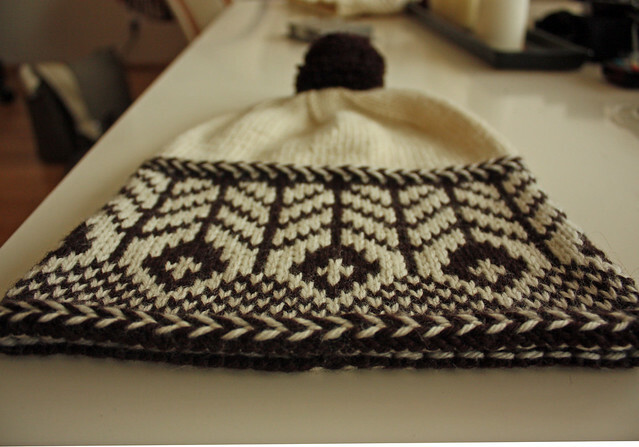 Thank you for interspersing your knitting posts with pictures or information of Iceland. I very much enjoy your blog. PS...and the hat looks great. good morning Rod from a bit further south where it is cool too. I couldn't agree more with you regarding the Noro yarn. I never understood the hype about this yarn after using it twice. Your new hat and cowl look great, timeless and still very stylish. Hola Rodrigo, bueno que más queda decirte de que todo lo que haces es una maravilla. La ceniza del Puyehue sigue molestando, es más ahora que llegó la primavera se puede ver la fumarola y todo! Así es la naturaleza, veo que te estás preparando para el invierno. A mi me encanta tejer gorros y guantes, porque son elegantes y rápidos de hacer. Un beso. 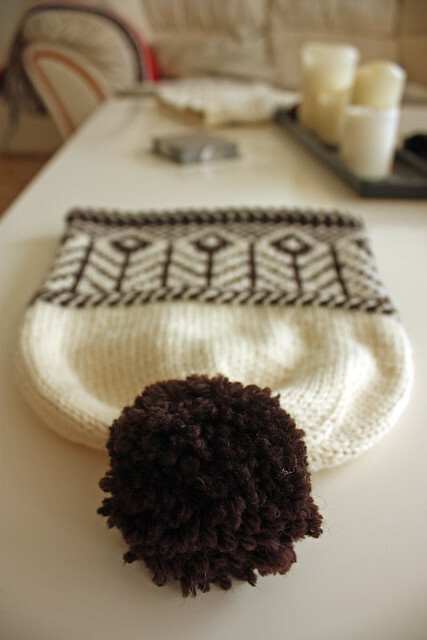 Me encanta el gorro del pompon!!!!!!!!!!!!!!!!!!!!!! Genevieve: Yes! Winter is finally coming! Isn't that wonderful! Today there was frost everywhere... the grass covered with this beautiful white layer of ice! Kristín: Ég veit ekki hvað ég var að hugsa þegar ég keypti þetta garn! RÍSAstórt mistök! Og verðið! úf! Ég vil ekki einu sinni hugsa um það! Hlakka til að sjá þig á morgun!! Rodrigo acabo de descubrir tu blog y me encanta, estoy enganxada! voy a leerlo de cabo a rabo! Greetings from the beach. I couldn't resist peaking to see what you posted. Unfortunately, last night I wrote a nice long comment, pushed the button to post it, and it all went away! :-( Hopefully that won't happen this time. I must say I am glad I no longer live where I need "winter accessories." I do not tolerate tight things around my neck so seeing the cowl buttoned tightly around your neck almost made me cringe. It did pique my interest in the Brioche stitch though. Will have to look it up. Hats: Rarely to almost never has a hat been put on my head. If my ears got cold, I wore white, fluffy earmuffs. I like the colors in that first hat. 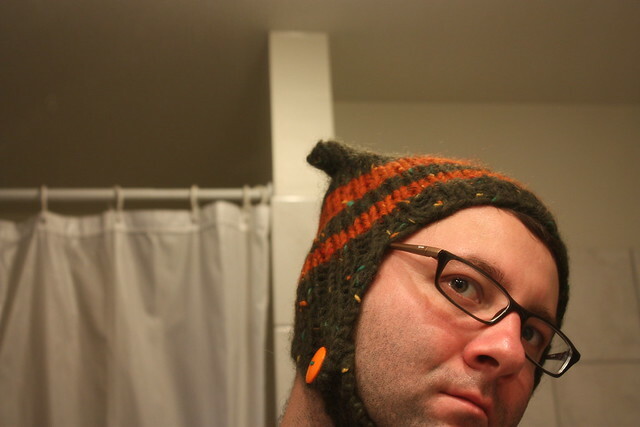 The second hat, well...hmm...probably not the most flattering, but does look like it would keep your head warm. 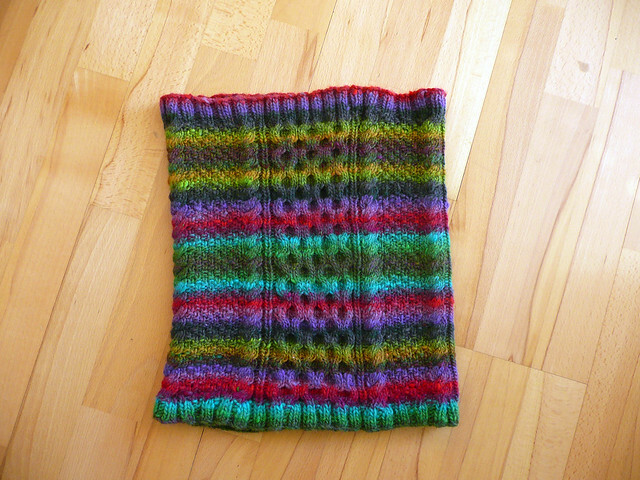 Like you, I'm not a fan of Noro yarn, but I do like the colors in the cowl you gave to your sister. Lucky girl! I really like the one you just completed, but it "fell asleep in the stash basket"?!! :-) You make me laugh - you are one creative fellow! I do like the pattern and the shorter length. I really, really like your new hat! Love the pattern and the two colors really make it stand out. Those bands just "make" the whole thing, and doubt they are that easy (for you, maybe!) You're right about the pom-pom. Perfect finishing touch and you made such a great, full one. 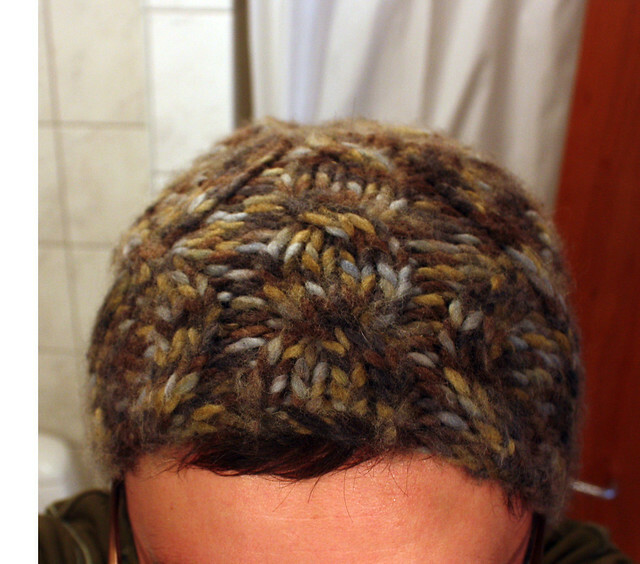 :-) I really like Cascade 220 yarn. I was going through my stash recently and came across 4 skeins of it. They were unusual colors for me, so wondered what I originally bought them for. I had recently purchased 4 skeins (and when I got home realized I bought the wrong yarn for the item) so will have to find something I can make to combine them all. I also like the Cascade 220 Superwash and the Handpainted yarns. As usual you treat us with some really neat photos. Fascinating place you live in. Eva looks cold, even though she is all bundled up!! Hope you got the pictures I sent because there won't be any new ones this trip. I forgot the camera! I can't believe it!! Beautiful full moon reflected on the water last night and this morning the water is so calm, with definite "lapping" on the sand. Oh well, will just have to store the images in my mind. Primero que nada, tiemblo al pensar lo que quiere decir "really cold" en Islandia!! También intenté tejer un cuello similar en brioche y no pude, acabé haciéndolo en algo así como punto Inglés, que da la misma textura.¡El cuello de cables y el gorro están sensacionales! Y tengo la misma resistencia con los mitones, pero Ale del blog "Chácharas y tejidos" recomienda tejerlos los dos a la vez, sobre las mismas agujas y usando dos bolas separadas de estambre. Ya quiero intentarlo así, en su blog tiene el tutorial. ¡Muchos saludos! Me voy enamorada del cable cowl, quien fuera tu hermana para quedarse con el de colorcitos, pero tienes razón luce mucho más en liso, y el crudo que elegiste queda sensacional. The Peacock hat is really cool. Before I read the text the first thing on my mind was "how the heck did he do the stripey bands"? It is great to know that it is not difficult. The cowls are also great. 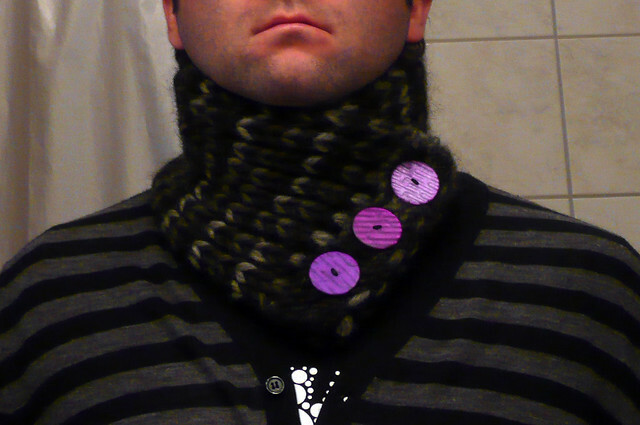 I don´t wear cowls (I need something really huge around my neck when I´m cold) but I like how they look. Especially when they´re cabled. And yes, I totally agree that Noro is overhyped and overpriced. But I like it when used for knitting small objects like hats or mittens. Nuevamente por aquí y me encanto tooodo, el gorro. el cuello, las fotos...miro y miró, porque la traducción es algo extraña y a veces no entiendo todo :) pero basta con mirar y entender que tejes maravillosamente...eso no tiene idioma no?Donde puedo aprender a hacer ese hermoso gorro..me conformaría con aprender a hacer el borde jajaja. Judi: Thank you for taking the time to read this and even write a nice comment from the beach :) What is it that you lose your comments so often? Is it blogspot or your computer? 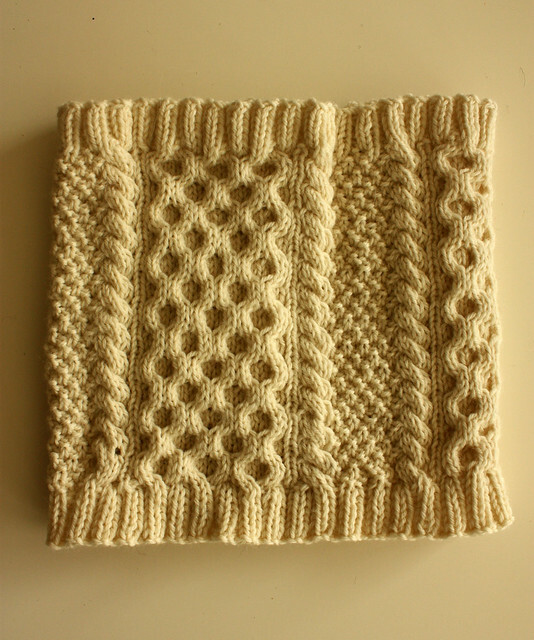 Brioche stitch is VERY nice (especially once you understand it). It is possible to make wonderful things using two colors. I hope you're having fun!! Ada: *blush* The bands were ridiculously easy to make... the yarns tangle when you're making the first half of it (it is made in two rows) bur then you go in the opposite direction and then the yarns untangle. I agree with you... Noro might be ok for little things or just for details. I really like you Peacock hat!